AMES, Iowa – America’s SBDC Iowa (SBDC) is pleased to announce that Amy Dutton, Regional Director of the University of Northern Iowa SBDC, Cedar Falls, has achieved certification in the Certified Business Advisor® (CBA) program. “Congratulations go to Amy for the hard work and dedication in earning this coveted designation! 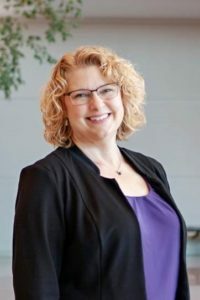 This is one more example of Amy’s dedication to learning and improving her business skills to further assist Iowa’s small businesses,” said Paul Kinghorn, Director, Center for Business Growth and Innovation at the University of Northern Iowa. Dutton has been counseling businesses in Black Hawk, Bremer, Buchanan, Butler, Chickasaw, Fayette, Grundy, Howard and Tama counties since 2016.